Make music a family event! 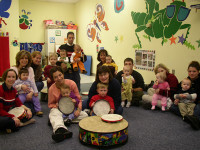 Children and parents will enjoy a variety of songs, games, and chants in a class environment designed specifically for family music making. Come sing, dance, and play!